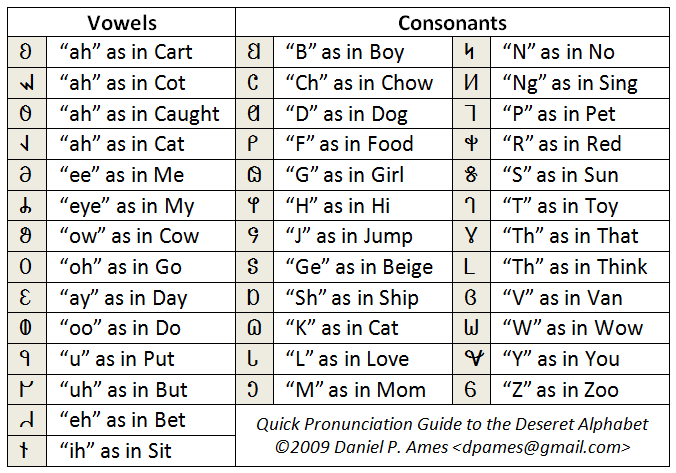 Technical note: I've been concerned about the readability of Deseret Alphabet given the nature of the characters all being the same height with very few "hooks" that can be used by the eye to quickly discern characters. With Roman characters we have many lifts and drops (for example the tails in d and p in the last word) that help us quickly discern the word. Imagine if the word drop were written as such that the tail on "p" were removed and the lift on "d" were replaced with a swirl. This makes the letters more uniform in height and shape but at the same time tends to reduce the readability a bit. To counter this effect, I've written the quote above using different heights of letters for vowels versus consonants, and I actually quite like the result. Please feel free to comment.